Posted in Misc and tagged De Monday Papers at 1:55 am on March 18, 2019 by Admin. Oops posted this on the wrong thread earlier..anyway..
Those are very interesting – first time i’ve seen them mentioned anywhere media-wise, yet they are pretty explosive. Why is McIlroy standing like that? photo caption says he was showing off gold plated sole on shoe. 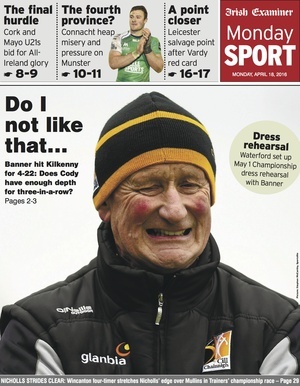 Anything good in the Wexford People? Apart from this over-the-top apology to the sainted Mick Wallace? If you search for the ICMSA article which gave rise to the apology, there’s a cached copy on the Indo website, the original appears to have been taken down, Both the Wexford People and Indo are owned by INM. By the sounds of it they got a LOT wrong in that article. That’s what happens when you publish inaccurate rubbish in the press, shame the same doesn’t go for comments. In response to the Sunday Times revelation yesterday of a €100,000 “short term loan” from John Delaney to the FAI in 2017, the FAI is to hold a press conference to address the matter on……… 3 April 2019! In a fortnight’s time! Still no word on why John Delaney spent 3 hours in the High Court on Saturday trying to convince a judge to injunct the story, sure, doesn’t it paint John in a great light, coming to the rescue with a dig out for an organisation with a turnover of €50m a year and which receives millions a year from the taxpayer. 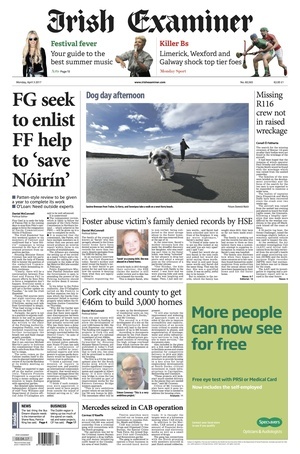 According to the Times Ireland today, the story is growing legs. It was very good of John not to charge any interest on the short term loan! The auditors Deloitte have questions to answer and there are also questions about the omission of the loan from related party transactions note to the 2017 accounts. Unless it wasn’t just one ‘bridging loan’. Without a full explanation, the alternative is to speculate. If Delaney had any sense, and everything is above board, he would come out with ALL of the details of this. As CEO of the FAI he would have had control over ‘repayment’, and the accounting (or in this case, it seems ‘not’) for transactions. If there was nothing untoward about this, then why would proper accounting not be done? And why the attempt to put a lid on it? And of course an obligatory well respected international accounting outfit mentioned. I can think of only one scenario where this Delaney activity makes any sense whatsoever. Am I correct that in Ireland it would be a criminal as opposed to being a civil offence? Correct Martco AFAIK. The Ireland Fund tactic of a civil action to recover monies would not be the norm here. Meet Dinny, the Honorary Life President of of the FAI. He’s a fan. How are Delaney’s wages of 360000 justified? And he had the cheek to accuse Catherine Murphy of looking for publicity? The joke is on us as usual! This is the 2018 Annual report which includes financial statements for the year to 31 December 2017, the year in which the John Delaney “short term loan” was made and repaid. Why would he include the last line? He’s very specific about it being the only short term loan, isn’t he? Another reason in a long series of reasons why John Delaney should be sacked, today preferably. Im sure someone will have some ‘blood curdling’ (The Quiet Man) stories to tell at some stage. Teenager Aussie larrikin becomes worldwide sensation for egging mimsy-tushkin of a politician who, in the immediate aftermath of the NZ atrocity on Friday, blamed Muslim immigration. Some people have remarked how some of the worst anti-immigration mouthpieces have Irish surnames, but we have some redemption, #Eggboy is a Connolly! A Muslim woman criticising a white woman is what it take to get Clampers defending a Clinton. I was all for Bill back in the day, although a Dem, his views would be considered right wing today, and I have no issue with Chelsea. My comment by the way, was more a note on the hysterical nonsense that is accepted and cheered from far Leftist loons. And just one example of such daft thinking you’re so accustomed to consuming. My comment by the way, was more a note on how, the day after 49 Muslims were massacred by a white nationalist inspired by modern right wing ideology, a grieving and angry Muslim woman dares to criticise a white woman and it’s quickly back to the supposed hysteria and nonsense and looniness and daftness of the modern left, who haven’t massacred anybody. She has a history of antisemitism, and loony views. Plain and simple. Are the loons not to be called out for their stupidity now… cop on. Come on, attacking Chelsea Clinton was ridiculous and uncalled for! She had zero to do with any terrorism/racist attacks. The left has to find a way of defusing this culture of identity politics for the approaching 2020 election. It will harm their own candidates. It’s not really whether she was right or wrong, it’s more the response Junkface. There’s a time to act with a bit of grace and kindness. Save the pummeling for the dangerous racists and nationalists on the right. I mean identity politics? A white nationalist murdered 49 Muslims. There’s the identity politics that kills people. Chelsea showed both grace and kindness, and patience, to the raving antisemite who accosted her and showed none of those qualities, in fairness. Instead she opportunistically used the atrocity to attack Chelsea for something both Dems and Reps have called Omar out for. Grace and kindness… indeed. After the Bataclan attacks would you deem it reasonable to approach an Imam from a random mosque and accuse them of what Clinton was accused of? The idea that because she used “as an American” was somehow racist highlights how ridiculous the stunt was. Clinton is also preggers. Really poor form from the pair. I think the woman who confronted her might have gone slightly over the top with her wording in the heat of the moment, but I agree with her general sentiment. Clinton had recently used her huge social media platform to join in the hysterical weaponised antisemitism baiting of Ilhan Omar for merely stating what is a almost entirely taboo subject to mention in US politics – ie the unspoken influence that the Israeli lobby’s vast amount of money has over US elected officials. Nothing antisemitic about that. There have been rare articles in the past about the lobby’s enormous influence by US journalists in the NY Times, New Yorker, etc but no outcry then – however they weren’t Muslim. So in that context of recently using her public platform to vilify Omar, one of the first two Muslim women to be elected to Congress, who is seen as an inspiration and role model for many Muslims, it was poor form of Clinton to then show up at the vigil and expect to be greeted warmly. And as the woman who confronted her says, “searching extensively through my tweets for things I said when I was 14/15 and not fully socially conscious is a blatant attempt to pull a ‘gotcha’ and delegitimise me. I’ve grown significantly in the 1/3 of my life that’s passed since then”. If she had grace and kindness, Clinton would have used her better judgment at a time of high emotion, kept her mouth shut and stayed away from the vigil. Democrats are not exactly rushing to her support. 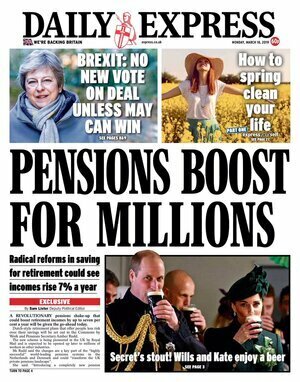 The state of the Royals and their dogsbodies on the front page of the Express, humorlessly choreographing the impression of drinking a Guinness, the drink of the former colony. I suppose, God love them for making huge efforts in the past decade, particularly after the Brexit vote, to improve English-Irish relations, but Jebus, it looks so forced at times. Royal PR Photos are stage managed? What a conspiracy you’ve cracked..
Aaaahhhhhh you’ve woken me from my slumber. Every politicians public photos are stage managed. Apart from the Leo lad who put his sash on upside down. Or the Enda fellow falling over a flower pot. Or Joanie being engulfed by 6” tsunamis in Thomastown. Or the lap dance in Dáil Éireann. Or Mary Lou behind the banner ( well maybe that one was). 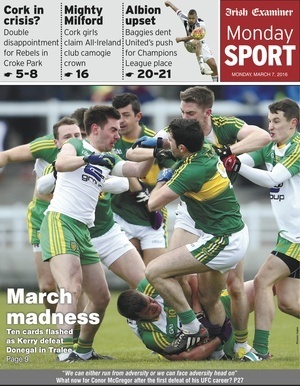 Absolutely distraught at the lack off front-page coverage of the goys in green. These are world-beating leviathans who had the southern hemisphere rugby nations quaking in fear. Not even a picture of former Irish great Warren Gatland with a big smile on his face. It almost like the boys have become invisible. But it’s good to see ’em keeping their powder dry ahead of the World Cup. (*) Best coach in the history of rugby ever.Just saying like. Who cares about the Irish Rugby team? St. Michael’s won a third Leinster Cup. That’s real rugby. None of your namby-pampy Guinness/Gillette/Hair Gel aul wan social media influencers worried about their hair stuff. poor little charger, England still fourth.. 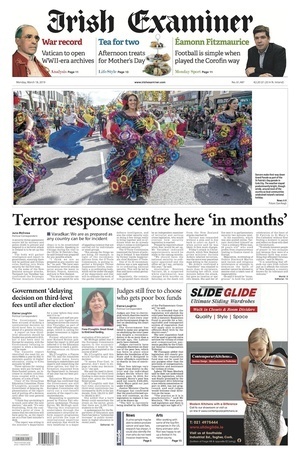 Typical Murdoch Times whinge about minor incident over St Patrick’s Day Banner. 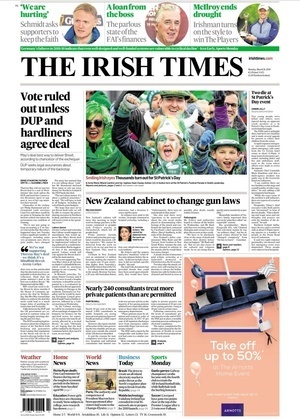 I missed reading yesterday’s Sunday Times in Ireland edition for free in Centra. Can anyone confirm the backpage had the usual anti-Sinn Fein snark from John Burns (@JohnBurnsST) without him again declaring he was a Sinn Féin The Workers Party member? Which Ireland would that be,the one where ya da hires you as his assistant when you have no experience,the one where after da dies you inherent his seat-the Ireland of nepotism where TD’s in FG pass on their seats to their kids,like royal privilege…. I’m embrassed for Ireland’s pound store Ivanka. 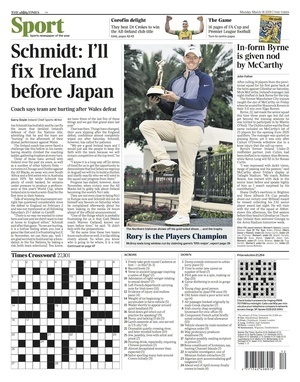 That’s the Ireland that FG says ‘Come on in, one and all and disintegrate us’. Surprised at McEntee. 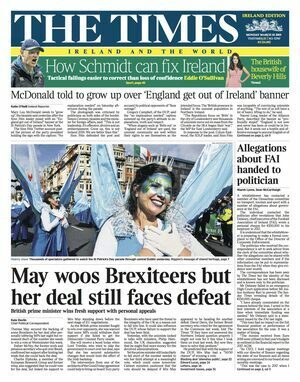 I thought she was a relatively honest politician, albeit used by Coveney and Varadkar to take the Brexit flak. Of course, this and other tweets and press releases are designed to try redirect attention from Varadkar and his ‘Awaiting legal process’ McGregor appearance at the head of the St. Patrick’s Day parade. How does one change the image at the left of the poster’s name? I’m fed up of the octopus one. Three relatively poor friends went to a second-hand shop to buy a power washer. The price on it was €30. They each handed the salesperson €10. 3x€10 = €30. The salesman, being not very honest thought to himself….pheck it, Ill only give them €3 back, and keep €2 for myself. So that’s what he did. He handed back €1 to each of the friends. 9 x €3 = €27. Where did the other €1 go? It’s very simple. The 3 friends paid €25 for the power washer and gave the salesman a €5 tip. He gave them back €3 meaning they paid €25 for the power washer and gave a €2 tip. €25+€2=€27/3=€9 each. For those suffering hangovers after yesterday, it might simplify things if you imagine each of the three buyers had 10 x €1 to start out with, an overall total of €30. Where is the €30 after the transaction above? X is in the pockets of the buyers, Y is in the pocket of the salesman and Z is in the till of the shop. No money has vanished in this transaction! The €2 the salesman kept is part of the €27. I know there are some conspiratorial minds on this site so please- give me a good one as to what is going on with Brexit. May wanted to have the same vote for the third time without substantial changes which is against the rules. Fair enough. 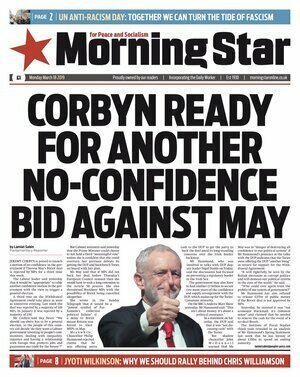 And then there is a talk of a short extension, in the run up to European elections, which is not going to happen, it cannot. If they are still in the EU then they MUST vote, end of. So then the can of worms is really opened. Door to door canvassing will need police protection in some areas but, for once, politicians will really have to put their money where their mouth is. The half of the country who were bullied into silence is trotting off to the electoral stations while the other is doing what? Led By Donkeys‏ @ByDonkeys has to be one of the most inspiring grass roots movements of our times. Maybe we should try it here. My theory is that May (she is anti-brexit, but trying to be seen as running with the will of the people) is trying her utmost to stop brexit, but giving the impression that she’s the people’s advocate at the same time. There are hundreds of MPs and i’m sure some other at least could have seen this coming. It’s hardly a surprise that it came to this. Discussing it briefly last night, a friend of mine said to me that the % between the out vs. in was close, and that the misinformation put out by the Brexiteers is becoming clear now, along with the death rate of stalwart British and newly entitled voters, the slim majority might not be a majority now.. So, in my conspiratorial view, May is trying to keep the UK in the EU. As referendums aren’t legally binding but do give the opinions at a particular moment in time, she is going for a new referendum, or failing that being allowed, or feasible, she will rescind Article 50 and take a year or two of personal flak. 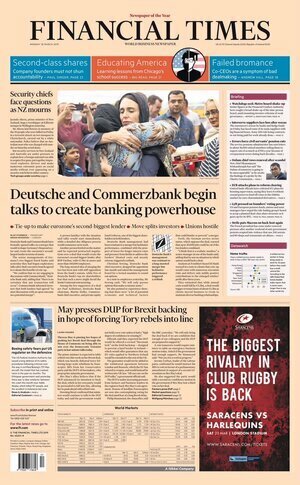 (Anyone seen Cameron being pursued with pitchforks and torches? – after all he is the one that brought this about). 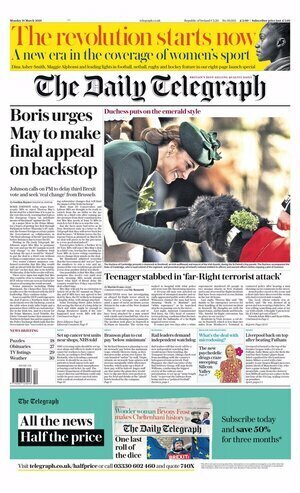 One last mention – there is no existence of a backstop, or a withdrawal agreement. (yet anyway). That quite strange light blue puffer-wool coat combo owes her no favours for sure. If she wears it any more she’ll look like she comes from Kilkeel. The Backstop and WA both exist and have been the subject of much debate and at least 2 votes in the HoC. a) Teresa May trying to get an agreement? b) Is the notion of a backstop still being discussed? 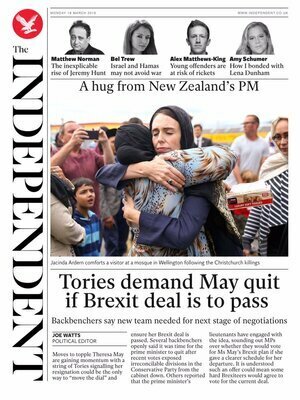 Theresa May is trying to get the withdrawal agreement, which includes the backstop, through her parliament. If it doesn’t exist what is she trying to get through parliament? it had a couple of angles that don’t usually get a lot of mention..there is a theory that she’s more Tory than the witch herself ever was & will put the party above all else, if she ends up driving the bus off the cliff because the outcome suits her Conservative party or plain and simple runs out of time then so be it territory. I also think that the various actors along the way like that streak mogg have mainly been playing with the thing to make cash for their own benefit. 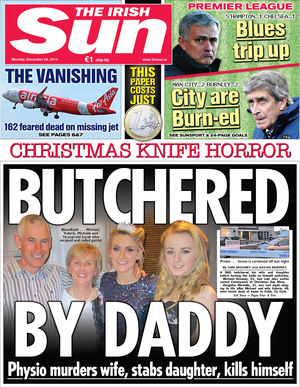 I know it was too late for the papers last night, but horrible tragedy at The Greenvale Hotel, Cookstown, Tyrone. 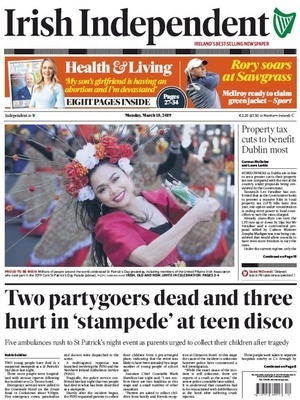 3 teenagers died as a result of a crush, queuing for a “Disco?” on St.Patrick’s night. 2 of the 3 kids were attending my Alma Mater, St. Patrick’s Academy, Dungannon, the third at St.Patrick’s College, Dungannon. All St. Patrick’s students – it’s too soon for irony. The hotel is very popular and very well run, I know the owner personally, he’s a 6′ 7″ lovely, gentle giant of a man – he made me cry, when he was so emotional addressing the tv press. Clearly, something went wrong with security/crowd control. Tragic! Tragic indeed. I can understand if they were inside trying to get out but a stampede trying to get in… Was it a case of first-come-first-served and over-capacity so they knew some people would not get in? It was a get-in, @9.30pm. The doors hadn’t opened. Too many enthusiastic types – perhaps more than envisaged? Security would have held back. There were reports of fighting – there was no-one fighting, just people trying to save people. Even if the venue had not opened, those children were still on the hotel’s property and they failed in their duty of care. From here on, I expect a lot of venues will no longer be able to hold under age discos as such will be specifically written out of their public liability insurance. None of this is any consolation to the poor families of course.